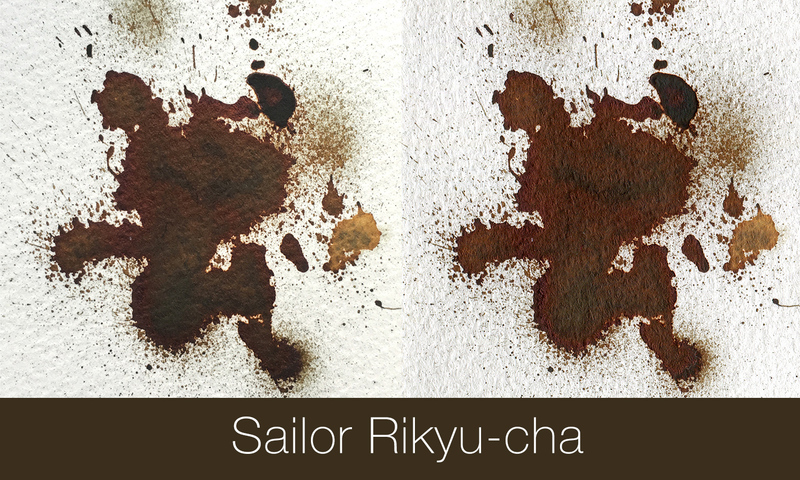 Sailor recently re-released the old four seasons inks. Sadly it's a limited edition (again!) and I had great difficulty to have finally got three of them. A gorgeous greenish brown with a coppery matte sheen. It writes down as green and quickly dries to brown. Does this remind you of something else? Pen & Message Cigar? The exact same colour, the same sheen, the same colour change, and the same behaviour. I'm going to convince you they are the same ink. Well, maybe, just maybe, Rikyu-cha has more green. Edited by Lgsoltek, 05 May 2016 - 12:18. The ink blender was asked to make a shop exclusive ink which turns from green to brown in drying. That's how cigar came into being. This was back in 2012, so most likely this was the inspiration. Still waiting for my lifetime supply of bottles of this ink. I don't think they are the same ink, but I will agree that no one can tell the difference unless side by side. And even then, you need good eyes. I bought two bottles when Rikyu Cha the first time around. The first bottle emptied fairly quickly what with sharing. I used up the rest a couple of years ago and recently, without thinking about it, opened the bottle and realized, oh no, this is my second bottle! I hadn't opened it until then. Good to know that Sailor has made more. 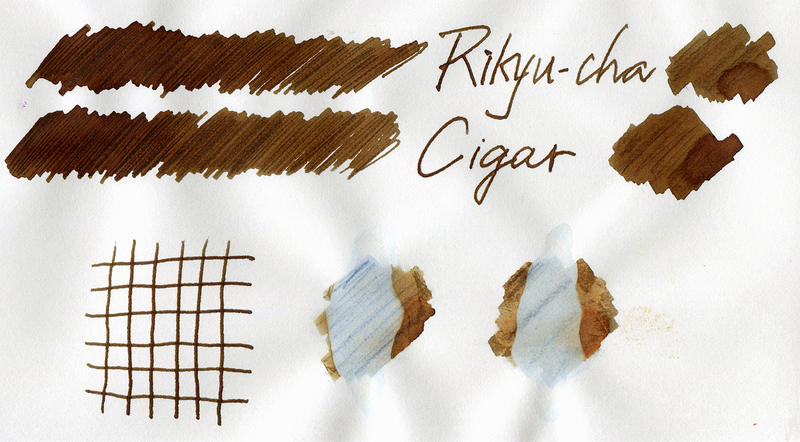 Rikyu Cha is a strange, entrancing ink. The two inks look pretty different to me , but I'm a fan of nuance differences between inks. As Legsoltek noted, the former has more green than the latter. Another similar color is (in a wet pen) is Ishida Bungu Hokkaido Gagome. Send me a bottle for my birthday. 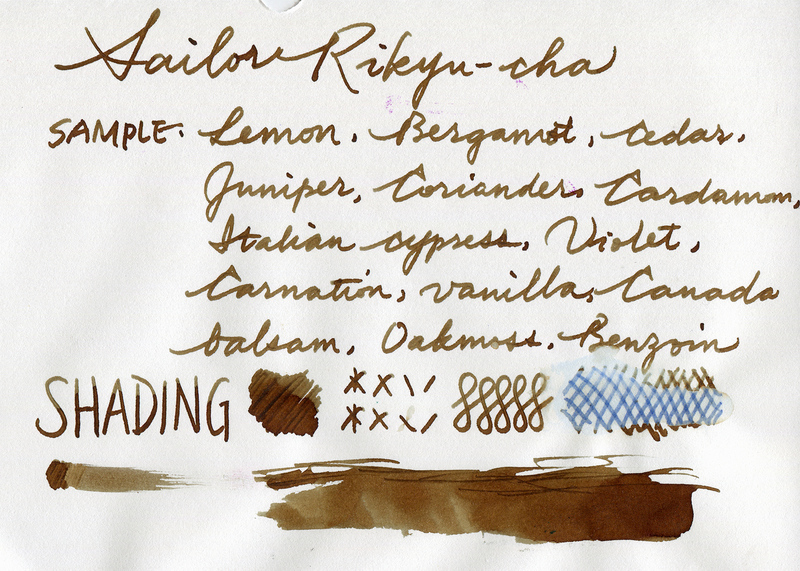 I think I really like this ink -- alas I can't seem to find a vendor for it. Any suggestions? ETA: I checked Engeika (and that auction place where we all end p eventually), and it doesn't seem to be listed there. Edited by Graphemer, 06 May 2016 - 01:58. Great review! Truthfully, this color just doesn't do it for me. Thank you for sharing the magic with us. Aside from the odd auction on EBay, it's not attainable unless you have friends in Japan. One can only buy directly in the store now. The owner shan't take online orders or emailed requests to reserve bottles anymore. Thanks for yet another fine Ink Review! When I had a wee shufti at the initial offering some years ago, I was enthusiastic, and remain ever so pleased every time it comes out to play. It seems the current version retains the essential aspects of its name-sake: subtle lovely and elusive. Somewhat like a benevolent person reading the tea leaves in my cup after dim-sum. Edited by Sandy1, 06 May 2016 - 23:26. So Rikyu-Cha is not merely an LE ink, but a store exclusive?! Bummer. I would have stocked up on this one, were it something I could find. I'm not sure about limited edition, but it's not a store exclusive. Supply is limited, and most are just doing over the counter sales. Apologies for being so vague! I was referring to Pen and Message Cigar. 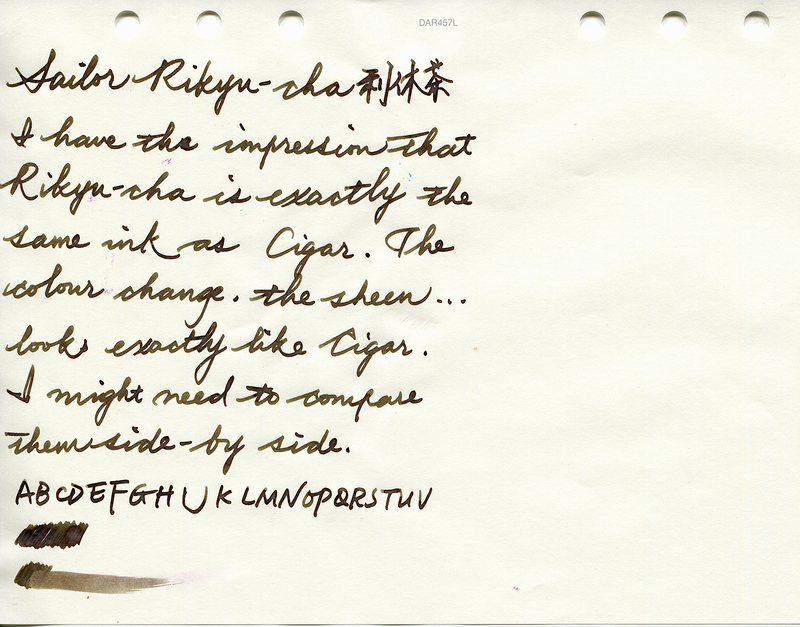 As for Rikyu-cha, it's as Mew said. Does this remind you of something else? Pen & Message Cigar? The exact same colour, the same sheen, the same colour change, and the same behaviour. Thank you for stating this. Now I don't have to go crazy trying to track a bottle of this down. It looks like an ancient manuscript ink!!! Sailor... why must you be so mean? Not being funny...but I've just received a sample of J Herbin Lie de The today... Is it a million miles off from this one in terms of colour?